You will find below the horoscope of Jessica McClure with her interactive chart, an excerpt of her astrological portrait and her planetary dominants. Horoscopes having the same aspect Sun square Neptune (orb 0°02'): Lady Gaga, Paul McCartney, Julien Courbet, Carl Jung, Ellen DeGeneres, Caroline, Princess of Hanover, Edward Norton, Angela Merkel, Hilary Duff, Frédéric Chopin, Marie Antoinette, Kevin Costner... Find all the celebrities having this aspect. Horoscopes having the same aspect Mercury square Ascendant (orb 0°14'): Shakira, Jim Carrey, Audrey Hepburn, Ted Bundy, Lambert Wilson, Harrison Ford, Nostradamus, Stephen Hawking, Charles, Prince of Wales, Jennifer Garner, Hilary Duff, Denzel Washington... Find all the celebrities having this aspect. Celebrities clicked on in real-time: 577,150,201 times. Jessica Morales née McClure (born March 26, 1986), became famous at the age of 18 months after falling into a well in Midland, Texas on October 14, 1987. Between that day and October 16, rescuers worked for 58 hours to free "Baby Jessica" from the eight-inch-wide hole. The story gained worldwide attention (leading to some criticism as a media circus), and later became the subject of a 1989 ABC TV movie. As presented in the movie, a vital part of the rescue was the use of the then relatively new technology of waterjet cutting. The rescue of Jessica McClure was the first such "child down a well" story in the age of round the clock, live video broadcasts. Here are some character traits from Jessica McClure's birth chart. This description is far from being comprehensive but it can shed light on his/her personality, which is still interesting for professional astrologers or astrology lovers. 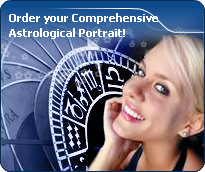 In a matter of minutes, you can get at your email address your astrological portrait (approximately 32 pages), a much more comprehensive report than this portrait of Jessica McClure. Jessica McClure, the diurnal South-eastern quadrant, consisting of the 10th, 11th and 12th houses, prevails in your chart: assertion and goals achievement are at the centre of your concerns. You are very keen to implement your dreams and your plans. You achieve your ambitions as soon as possible, whether through an active social life, highly charged friendly relations, or an urge to take actions in order to reap - in the eyes of the world, of course - the rewards of your dynamism. It is likely that spirituality or humanitarian actions are part of your motivations, sometimes at the price of some degree of isolation. Jessica McClure, Fire is dominant in your natal chart and endows you with intuition, energy, courage, self-confidence, and enthusiasm! You are inclined to be passionate, you assert your willpower, you move forward, and come hell or high water, you achieve your dreams and your goals. The relative weakness of this element is the difficulty to step back or a kind of boldness that may prompt you to do foolish things. The predominance of Water signs indicates high sensitivity and elevation through feelings, Jessica McClure. Your heart and your emotions are your driving forces, and you can't do anything on Earth if you don't feel a strong affective charge (as a matter of fact, the word "feeling" is essential in your psychology). You need to love in order to understand, and to feel in order to take action, to the detriment of a certain vulnerability against which you should learn to fight. The Mutable mode is the most emphasized one in your natal chart, Jessica McClure, which indicates a mobile character that is curious and thirsty for new experiences and evolution. You are lively and flexible, and you like to react quickly to solicitations, but don't confuse mobility with agitation, since this is the danger with this configuration - and with you, stagnation is out of the question. Security doesn't matter as long as you are not bored. You optimize, you change things, you change yourself... all this in a speedy way. Your angular houses, namely, the 1st, 4th, 7th and 10th houses, are very emphasized in your chart, Jessica McClure: according to the Tradition, they are the strongest and most dynamic houses. Should the rest of your chart concur, angular houses suggest that you are an enterprising, energetic and assertive woman. Indeed, angular houses are said to generate impulsions and to give a powerful and domineering personality. After this paragraph about dominant planets, of Jessica McClure, here are the character traits that you must read more carefully than the previous texts since they are very specific: the texts about dominant planets only give background information about the personality and remain quite general: they emphasize or, on the contrary, mitigate different particularities or facets of a personality. A human being is a complex whole and only bodies of texts can attempt to successfully figure out all the finer points. You are sensitive to beauty, Jessica McClure, and your emotional reactions are often of an aesthetical order because, even in the appearances, balance and harmony are necessary for your well being. You easily identify with others, you have a talent for emphasizing their best qualities and you solve their problems with tact and diplomacy. You endlessly weigh the pros and the cons and you constantly try to please your interlocutors. In doing so, you may develop a strong dependency because you need their approval too much. It is difficult for you and your entourage to deal with your indecisiveness because it inclines you towards contemplation more than towards creation and you are tempted to procrastinate unless you try to charm others into doing things for you. But as long as harmony prevails... isn't it what matters? Love at first sight, flash in the pan, amorous impulsiveness? All these are part of your way of loving or to fall in love, Jessica McClure. Throughout your relationship, you maintain this kind of jerky and lively style, that may seem childish or naïve, but that is so generous and cheerful! You are undeniably possessive and you are not concerned with your partner's opinion but, fortunately, you readily forgive because of your spontaneity and your authenticity. When your relationship is intense, everything is fine. There is no romanticism, no complications with you. You love with ardour and, except for a few crazes and opportunities for new pastures here and there, the only danger may be that boredom settles in. In that case, you leave without regret and you quickly forget what consumed you, not so long ago. The ruler of the Ascendant, Jessica McClure, is Mercury. It is posited in the sign of Pisces and endows you with a vivid imagination. You are a sensitive and emphatic dreamer, always on the lookout for the inspiration which enables you to take action, although there is a risk that you keep on waiting - not without displeasure - for the said inspiration. With your amazing intuition, you sense the truth even before you understand it, and more often than not, your personality is endearing and appreciated by everybody. Jessica McClure, you are a real Goliath and you often excel in sport; your thirst for conquests prompts you to constantly launch new challenges. The enthusiasm you put in your undertakings is perfectly well supported by your moral concepts and an idealism compatible with the values of the society you live in. You are pragmatic, enterprising and sometimes, naive. You do not pay attention to details and you launch various great adventurous projects that are all doomed to success. In a few rare cases, you can funnel your huge energy into more philosophical, even spiritual or religious enterprises, where your entire fieriness works wonders. On the sexual plane, your ardour and your spontaneity are your main assets. The danger is that you may spread yourself too thin in the sense that you may forget about faithfulness, particularly during the extensive faraway travels you are so fond of. This text is only an excerpt from of Jessica McClure's portrait. We hope that it will arouse your curiosity, and that it will prompt you to deepen your knowledge of astrology, as well as to visit and use the wide range of free applications at www.astrotheme.com.